Does the "Synja Woda town" really existed? Шляхи з Києва до Брацлава у XV-XVII ст. This article describes the topography contained in a quite unusual and unexpected source – the book “Herby Rycerstwa Polskiego” written by the Polish armorist and historian Bartosz Paprocki, published in 1584. “One of the South-Russian military governors, namely Yurii Yazlovetskyi, pursuing the Tatars in 1571 who brought devastation in the lands of Kyivpodolia, went up to the heads of Ingul and Ingulets rivers and found three objects named “banya”, or, as Paprotskyi calls them, “laznya”. What were those objects? By all means, they were no other than our today’s watchtowers, but their construction was much simpler: four long pine logs were placed on the ground not far from each other, one opposite the other; inside this tetragonal tower was a ladder; on top, a cabin was made for the watchman; near such watchtower, a long pole was set, with straw sheaves tied to the top. Noticing a moving horde at the distance between 10 and 20 versts (a Russian unit of distance equal to 1.067 kilometers), the watchman would immediately ignite the straw or, as the Kossacks called it, the “figure”, this being the signal to do the same with other figures, serving as signs for the people to hide and run from the uninvited guests. One of the three “banya” could coincide with the Fedvar location from which there is a wide horizon view to the south, the distance being about 30 versts ”. The above-given quote contains a unique description of a steppe watchtower and its operation. But we shall get back to it later. Before the note about the 1571 march, Nykyforov provides a reference to the book by P.Kulish “The History of the Reunion of Rus”. This book contains a translation of the description of the march route followed by the crowned hetman, i.e. the Polish commander in chief, Yezhy (Yurii) Yazlovetskyi in search of the Tatar squad returning from Moscow with rich trophies, on the specified pages . This description has a detailed list of settlements, rivers, forests, ravines and hills passed by Yazlovetskyi’s detachment. Kulish provides this list as a sample of the geographical knowledge about the south Rus lands of that time. The route of Yazlovetskyi’s detachment lay from Bar, through Medzhybizh, Khmilnyk, Bila Tserkva to Kyiv, and then from Kyiv through Gorodysche, Korsun and Olshanka to the heads of Ingulets and Ingul rivers, then to Cherkasy, Kaniv, fortresses on the Dnieper river, back to Kaniv, Khmilnyk, Vinnytsia and Bar. On each section of the route, a lot of local toponyms are used, which makes the description interesting for the historians and regional ethnographers. There are three versions of the description of that road. 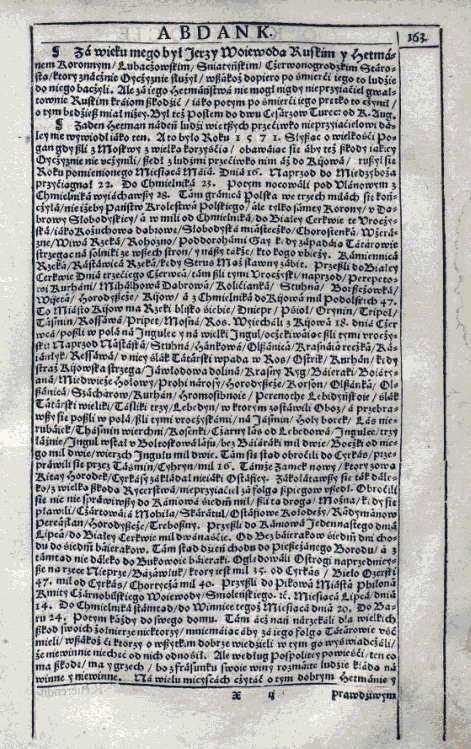 The first is published in “Herby Rycerstwa Polskiego” by Paprotski in 1584 . The second is published in the re-edition of Paprotski’s book in 1858  and does not copy the original text accurately and fully at all times. The third is the Russian translation mentioned above made by P.Kulish after the 1584 edition, and, on our opinion, it also has errors and inaccuracies. This description was known to M. Grushevskyi who quoted a part of it about the “most important fortresses on the Dnieper river” and A. Storozhenko . Below we provide the text of the description from the 1584 edition in our own translation and comments. The distance between the individual objects in the text is given in Podil miles . “In my time, Yurii Yazlovetskyi was the Russian military governor and crowned hetman. No other hetman would take so many people so far away against the enemy. This was in 1571. Having learned about the Tatars who were on their way from Moscow with rich trophies, he was afraid they would bring a lot of harm to his home land, and so he went against them taking many people with him to Kyiv”. 2 Naprzod do Miedzyborza przysiagnal 22. Do Chmielnika 23. First came to Mezhybozh May 22, to Khmilnyk May 23. 3 Potem nocowali pod Ulanowym, z Chmielnika wyjechawszy 28. Then spent the night near Ulaniv, having left from Khmilnyk May 28 Ulaniv, Khmelnitsk reg. 6 Slobodiska miastecszko, The town Slobodyshche, Slobodyshche, Zhytomir reg. 8 Wzerazne, Vchorashnye, Vcherayshe, Zhytomir reg. 9 Wiwa rzeka, Viva river, Not localized. Probably, it’s a lost name of one of the tributaries of Kamyanka r. or Rastavitsa r.
10 Rohozno, Rogozno, Rogizne, Kyiv reg. 15 naprzod, Perepetowi kurhani, At first Perepetovi kurgany, Kurgany (mounds) Perepjat and Perepjatykha between Fastivec and Marianivka, Kiyv reg. 22 a z Cmielnika do Kijowa mil podolskich 47. From Khmilnyk to Kyiv there are 47 Podil miles. 26 Stuhna Stuhna, Stugna r.
28 Olszanica Olshanitsa, Velyka Olshanka, Kyiv reg. 31 Ressawa, u niej shlak Tatarski wpada w Ros, Resava and the tatars tract not far from it, the tributary of Ros, Resava r.
32 Ostrik, Ostrik, Ostriyky, Kiev reg. 38 Miedwieze golowy Vedmezhi Holovy (Bear Heads), Pagan toponim that preserved from times where heads of totem animals were plased on the piles around the settlement. Not localized. 43 Olszanica Olshanitsa, Vilshana, Cherkassy reg. 48 szlak Tatarski wieliki The Great Tatar Route, One of the branches of the Black Route (the big road used by Tatars), placed near the Lebedyn forest . 49 Tasliki trzy Three Tashlyks, The place between Smila, Shpola and Kamjanka, where three rivers with “Tashlik” as a part of names flows . 52 Goly borek Golyj Borok, Birky, Kirovograd reg..
57 Ingulce Ingulets rivers, Brooks that formed Ingulets r.
60 bez Baiaraki mil dwie Besh-Bayraki 2 miles, See . 63 Tam sie stad obrocili do Cyrkas przeprawili sie przez Tasmin Cyhryn mil 16. From there turned to Cherkassy, conveyed across Tjasmin, Chigirin 16 miles. 64 Tamze zamek nowy, ktore zowa Kitay Gorodek There is new fortress, named Kitay-Horodok. 65 Cyrkasy zakladal niejaki Ostafiey Cherkassy were founded by somebody Ostafiy. “Ostafiy” − О. Dashkovych (1455–1535) – headman of Kaniv and Cherkassy. 66 Zakolatawszy sie tak daleko z wielka skoda rycerstwa, nieprzyjaciel za folga szpiegow uszedl. Reaching so far, with large losses for the soldiers, we missed the enemy. Words “za folga szpiegow” was not translated by P. Kulish. 67 Obrocili sie nic nie sprawiwszy do Kaniowa siedm mil, Returned, doing nothing, to Kaniv, 7 miles. 78 Tam ztad dzien chodu do Pieszczanego Borodu, From there one day by feet to Pishchany Brid, Pishchany Brid –the ford across the S. Bug r. .
83 Chortycza mil 40. Khortitsa, 40 miles. 84 Przyszli do Pikowa miasta Filona Kmity Czarnobilskiego, wojewody smolenskiego etc. Miesjaca lipca dnia 14. Went to Pikov, the town of Philon Kmita of Chornobyl, vojevoda (commander of an army) of Smolensk jule 14. Pykiv, Vinnitsa reg. 85 Do Chmielnika, ztamtad do Winnice tegoz miesiaca dnia 20. Do Baru 24. Potem kazdy do swego domu. From there to Khmilnyk, then to Vinnitsa the same month, 20, to Bar 24. Then everybody returned to his own home. Now we shall consider just one aspect of this text, namely the mentioning man-made checkpoints right near the natural landmarks: “lazny” and “bochki” (fragments 58 and 61 respectively). No doubt, they are the signaling constructions set not far from the forking of the Black Road (Chornyi Shlyakh). Another signaling object, Treboshny (Three Watchtowers?) was noted in the description of the way from Cherkasy to Kaniv (fragment 74). Let us return to the undoubted suitable conclusion of V.N. Nykyforov about the signaling nature of “laznya”/”banya”. Nykyforov provides a footnote to the text about the “laznya”: “A ”banya” – that’s how the Malorussians call a small eight-cornered construction having a ball and a cross on top of it, on the bell tower near the church ”. The exactly same bell tower with an eight-corner structure (eight stands of the second tier?) is depicted in the drawing by T.G. 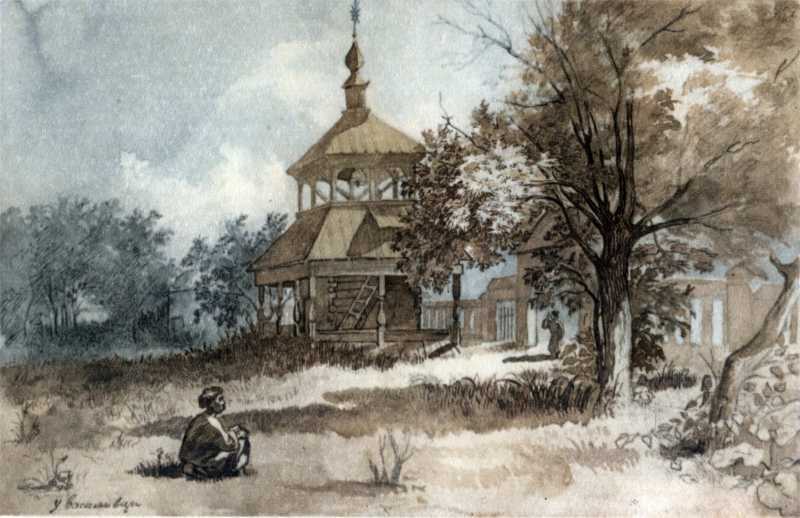 Shevchenko “In Vasylivka” (Figure 1). An eight-corner bell tower of similar construction but of the modern building still stands in the yard of the St. Nicolas Lebedynskyi monastery. To confirm the fact that the signaling constructions with this type of building could be called both “laznyas” and bathhouses, let us look up the meaning of these words in the dictionary of B.D. Grinchenko: “Banya: 1) A dome on top of a church or any other building; 2) a saltern, saltworks factory; 3) a healing mineral source ”,”Laznya: 1) Banya; 2) A low cabin with a small entrance where one might only crawl; 3) A pit to store grains ”. The roof of the “watchman cabin” looked the same and was structured in the same way as those built on the bell towers of village churches, i.e. banyas. But one could get up to that cabin only by using a ladder. By dictionary meaning, the word laznya was used to name the buildings to which one could only climb, so it might be used for a watchtower as well. Thus, this construction had the signs so that both words could be used to name it: laznya and banya. M.Grushevskyi recalls the use of artificial towers “on pillars” by the defenders of the steppe frontiers: “…on certain natural impediments (like hills etc. ), on the Tatar ways, graves or artificial towers “on pillars”, the watchmen stood, having horses at their disposal ”. It looks like that Nykyforov has the detailed description of just that tower. “Figures are a line of barrels set in a certain way and used for watch purposes. Each figure contained 20 one-bottom tarred barrels and 1 barrel without bottom; they were placed in five rows, one on one, in the form of a circle. First, six barrels were placed in a ring vertically and tied with tarred ropes, another ring of five barrels would be placed on top of them, then the third tier would have four barrels, the fourth would have three, and the fifth would have two barrels. One bottomless barrel was placed on the very top of that structure. Due to this arrangement, inside the figure was empty from the bottom to the top, and resin was poured inside it. An iron rod with the block and a long rope would be placed above the top barrel, one end of the rope would be lowered inside the figure with an iron rod tied to it and a large wisp of bast soaked in nitre, or a wisp of straw ”. It is impossible to find out whether the construction of the signaling towers of the XVI century differed from the one described in the XIX century. But there is no doubt, without any maintenance and repair such constructions could not last for long in the steppes, although the watchmen who used them are not mentioned in the description at all. “Later on (it means the end of the XVI century) the watch line would run forward to the steppes, up to Bratslav which sent its watchmen to Kamyanets-Podilskyi, on one side, and to Bila Tsekrva, on the other. Bila Tserkva watchers would meet the Bratslav ones in the West and Kyiv ones in the East ”. But the lands we are speaking about lie more to the south from the line Kyiv – Bila Tserkva – Bratslav – Kamyanets-Podilskyi, that’s why the question remains open as to who exactly placed the watchtower “laznyas” and “barrels” near the main Tatar route. 1. В.М. Никифоров. Село Федварь (Александрийского уезда, Херсонской губернии) // ЗООИД, XXII, 1900, P.42–44. 2. П. Кулиш. История воссоединения Руси, СПб, 1874 , Т.1, P. 40–41. 3. B. Paprocki. Herby Rycerstwa Polskiego, Krakow, 1584, S.163. .
4. B. Paprocki. Herby Rycerstwa Polskiego, Krakow, 1858, S.221–222. .
5. М. Грушевський. Історія України-Руси. Том VII., К., 1995, P. 136. 6. А.Стороженко. Стефан Баторий и днепровские казаки, К., 1904, P. 13,79. 7. Lets determine the length of Podil mile, based on distances from our text: Cherkassy – Kaniv 7 miles: 1 mile, approximately, 8 km. 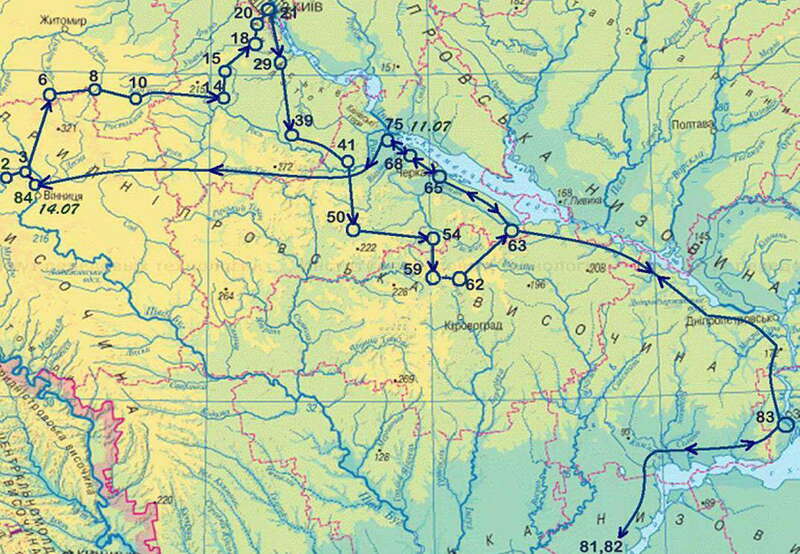 Kaniv–Bila Tserkva 12 miles: 1 mile, appr., 4,5 km, Khmilnyk–Kyiv 47 miles, Cherkassy–Hortitsa 40 miles: 1 mile, appr, 8 km. Determined length is close to large (ukrainian) mile (appr. 8,35 km), calculated from the description of jorney of Paul of Aleppo, see. N.І. Zharkikh. Paul of Aleppo. Metrology. .
8. “Струсь Станіслав (1516/1521–1567) – ротмістр оборони поточної, староста хмельницький.” Д. Вирський. Річпосполитська історіографія України (ХVI – середина ХVII ст.). Додаток B. С. Сарницький. Опис давньої та нової Польщі, Краків, 1585. К., 2008, С. 103. 9. About the origin of hydronim Kajalnik див. Н.А. Баскаков. Река Каяла в “Слове” и река Сюурлий в русских летописях. 10. Special Map of Ukraine by Boplan, 1650, see. В.Кордт. Материалы по истории русской картографии. Вып.II., К., 1910, табл. VII. 12. See АЮЗР, Т.13, с.559-560. 13. About Pishchanyj Brid on South Bug river see. Ф. О. Петрунь.Степове Побужжя в господарськім та військовім укладі Українського пограниччя. Замітки до Бронєвського та Боплана. Журнал научно-исследовательских кафедр в Одессе. – 1926. – Т. 2. – № 2. – С. 91-103. 14. “[Шлях] веде від порту Понта Евксинського, тобто від міста Кафи, через ворота Таврики і Таванський перевіз на Бористені, а звідти степом на Київ”. [Переклад з московського видання: Михалон Литвин. О нравах татар, литовцев и москвитян. – М., 1994]. 15. В.М. Никифоров. Іbidem, С.42. 16. Cловарь украинского языка (под ред. Б.Д. Гринченка), К., 1907. Репринт К.,1958, Т.1, C.27. 17. Там же, Т. 2, C.341. 18. Т.Г. Шевченко. Мистецька спадщина. Т.1, 1830−1847 рр., К., 1961., рис. 232. 19. М. Грушевський. Там же, C.38. 20. Д.І. Яворницький. Історія запорізьких козаків. Л., 1990, Т.1, С.235.